As a young institution (founded in March 2002), the goal and purpose of HFM School of Theology has always been to train and equip our students by providing ministry leadership training through distance learning. Our programs are created from the highest curriculum standards within the framework of Spirit-empowered, biblical authority enabling our students to be challenged with spiritual passion and personal fulfillment. For that reason our current views regarding accreditation is with Christian-focused agencies who bring integrity to our operations and the processes that result in HFM Christian degree programs. Our Board of Directors have approved our current accreditation. We completely understand that some students' personal preferences and professional needs require that they earn degrees from institutions that are Regionally Accredited by US DOE-approved agencies. We also know that many students' desires and aspirations are fulfilled by a school with with a less secular accreditation. 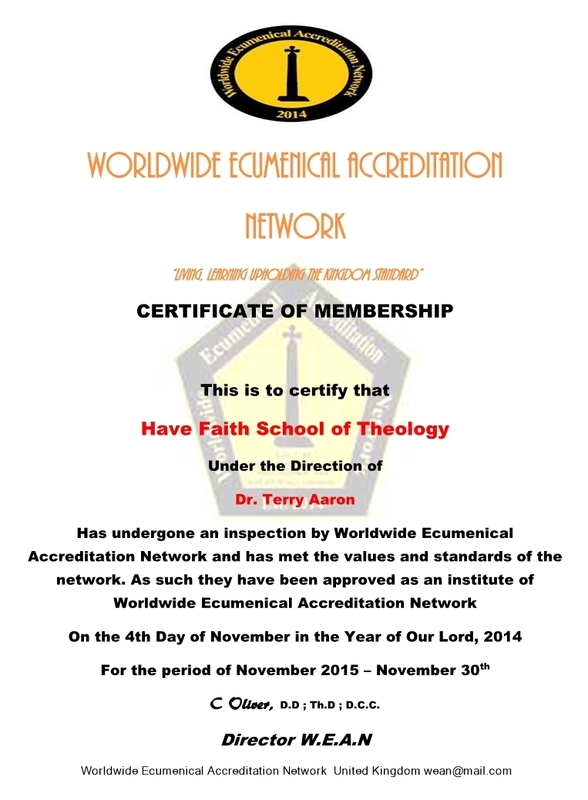 HFM School of Theology is now accredited by W.E.A.N. in the United Kingdom and with AFIRE in the United States. With that in mind, we completely trust God to bring us students whose needs we can meet and help to fulfill their God-given call. As a result, we are delighted to have a diverse student body of committed, diligent, and creative ministry students whose desire is to fulfill the Great Commission and to work powerfully and effectively in their God-ordained ministry. Our students enjoy the challenge of expanding their faith and practicing excellence in their educational pursuits. We are honored to have you consider joining them. * Please keep in mind that most Bible Colleges and Christian Universities do not have secular regional accreditation. In the United States of America, jurisdiction over degree-granting institutions rests with the individual State governments. Compliance with state regulations is the necessary condition for offering a legitimate, legal American degree. HFM School of Theology grants degrees under the authority of the Illinois Board of Education in compliance with TITLE 23: EDUCATION AND CULTURAL RESOURCES, SUBTITLE A: EDUCATION CHAPTER II: BOARD OF HIGHER EDUCATION PART 1030 PROGRAM REVIEW (PRIVATE COLLEGES AND UNIVERSITIES). The State of Illinois does not require regional or theological accreditation. HFM School of Theology is a division of Have Faith Ministries, Inc., a non-profit corporation located and registered in the State of Illinois, USA. . Section 508(c)(1)(A) of the US Internal Revenue Code states that “churches, their integrated auxiliaries, and conventions or associations of churches” are a mandatory exception to section 501(c)(3), they are already tax exempt without notifying or applying to the government under section 501(c)(3). Churches receive the same tax exempt status and benefits as a 501(c)(3) organization, without the partnership with the government. We do not have to lose our voice! 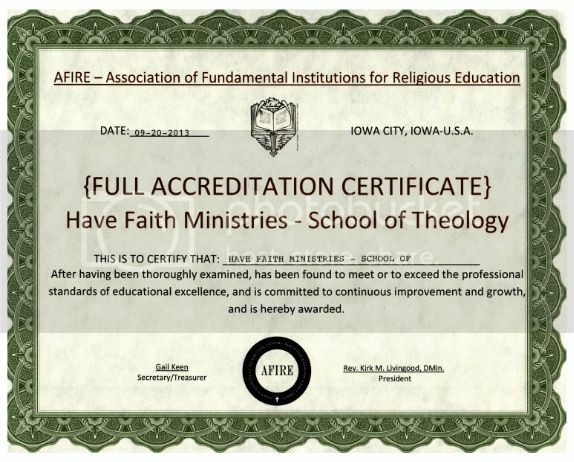 What separates HFM School of Theology from the "diploma mills" springing up on the Internet? Curriculum Standards: A legitimate institution sets real, definable curriculum standards, based on historical good practice, for each of its programs. Have Faith School of Theology uses the Harvest Time International curriculum. This is an approved World-Wide Christian Curriculum of Higher Religious Education. Instructional Delivery: A legitimate institution requires its students to undertake instruction, either from its own faculty, or from providers who have been accredited or approved. Authorization: Legitimate authorization involves the institution placing itself under the oversight of a duly appointed, sanctioned approval body. A legitimate institution grants degrees under the authority of the government agency in the State or Country in which it operates and by the Institutions that have conferred upon us Accreditation. Faculty Standards: A legitimate institution will contract with and employ faculty members who are appropriately qualified to teach in their disciplines, diverse in their educational backgrounds, and committed to academic excellence. HFM School of Theology is a private school and does not have or require a regional secular accreditation. If you desire to pursue a degree for secular employment, a degree with HFM School of Theology may not be the right choice for you. HFM School of Theology does not guarantee a job or ordination in any specific market or ministry. HFM School of Theology is not listed at this time with a U.S. Department of Education-approved accreditation agency, and a HFM School of Theology degree is NOT specifically suited for people pursuing "secular" jobs such as Public Teachers, State University Professors, and State-Licensed Counselors or Psychologists, among other vocations requiring state licensure. NOTE: Employees or a volunteer worker for a Church or Ministry as a "Pastoral Counselor" are EXEMPT from the State of Illinois from being required to be licensed. Also those who are Certified by a National Faith Based Organization, such as the National Association of Faith Based Counselors, are Certified Nationally. Thank you for giving us the opportunity to outline our approach to this very important issue. We wish you the best with your degree pursuit, and we look forward to serving you as an HFM School of Theology student. You have the right and the responsibility to select the appropriate school to meet your learning needs. No one knows your personal circumstances, special traits, needs, strengths and weaknesses better than you. If you are considering a private school, it is important for you to know some of the fundamental differences between private and public school in Illinois. Illinois’ private schools issue independent school diplomas that may not require approval from the State of Illinois. Illinois private schools establish their own system of school accountability, grading, reporting, and evaluating and are not included in the state's measurement of public schools. Private elementary and secondary schools are structured as private corporations, Churches, Ministries or private businesses that only report directory information and the enrollment of compulsory attendance aged students to the Department of Education. Private schools are not subject to school definitions and requirements specified in education statutes and they are not under the jurisdiction of the Illinois Department of Education.